LOWELL, Mass. – Six-time GRAMMY® award-winner and multi-platinum recording artist Amy Grant will perform for one night only at the Lowell Memorial Auditorium on Friday, October 18 at 7:30 PM to benefit Hope for the Children of Haiti (HFC), operating a children’s home for over 90 orphans and vulnerable children in Bolosse, one of the most impoverished sections of Port-au-Prince. “Amy Grant Benefit Concert for HFC Orphanage (Haiti)” will treat concert attendees to some of Grant’s biggest hits as she performs songs from her extensive repertoire. The benefit concert will include an opening performance by special guest Dan Russell, GRAMMY® nominated producer, founder of New Sound Concerts, and producer of SoulFest: New England’s Premier Christian Music Festival since 1998. 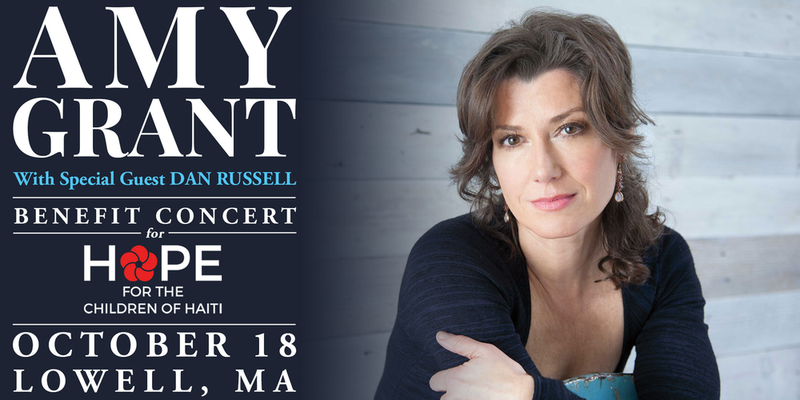 Time has come full circle: Russell, the first promoter to bring Amy Grant to New England, will now perform songs on the same stage. Russell will be performing songs from his debut album, Feel the Echoes. Tickets for the “Amy Grant Benefit Concert for HFC Orphanage (Haiti)” go on sale Friday, April 12 at 10 AM EST. Conventional wisdom has it that Grant put Contemporary Christian Music on the map, becoming the first Contemporary Christian artist to have a platinum record, the first to hit No. 1 on the Pop charts and the first to perform at the Grammy Awards. With that, her legacy as one of the most influential artists of the past four decades is assured. For more information, visit www.AmyGrant.com. Hope for the Children of Haiti (HFC) is based in Natick, MA and Lexington, KY and was founded by longtime Winchester (MA) resident, Dr. Marion G. Austin in 1996. HFC is a non-profit Christian organization who owns and operates a school and home for disadvantaged children in the capital of Haiti, Port-au-Prince. The organization has labored successfully on the front lines of global poverty and inequity for over 25 years. HFC employs a full-time in-country staff of 75 Haitian men and women who mentor, educate, and care for 91 in-residence children (mostly between the ages of 4 and 14) and educate an additional 300 children who live near the organization’s downtown Port-au-Prince home. Over 96% of all monies taken in by HFC are spent in Haiti on their Haiti program. HFC seeks to empower Haitian children with the tools they need to succeed in life while equipping them with the vocational and leadership skills needed to one day become effective adults who can make an impact in Haiti. For more information, visit www.hfchaiti.org. Haiti is the poorest country in our Western hemisphere with over 6 million living on less than $2.41 per day and more than 2.5 million living on less than $1.23 per day (extreme poverty). The country is regularly ranked in the top 10 poorest nations in the world. In 2010, close to 300,000 people died (most in under 30 seconds) when a magnitude 7.2 earthquake devastated the capital city and its surrounding areas. Dan Russell: artist manager and advocate, concert promoter, producer, creative collaborator, video and film music supervisor, and most recently, performing artist; has helped launch a thousand ships (well, maybe just a few hundred!) throughout his lengthy resume. For the past 35 years, Russell has been the critical aide-de-camp to dozens of artists such as U2, The Call and lead singer Michael Been, Mark Heard, Black Rebel Motorcycle Club, Sam Phillips, Robin Lane & The Chartbusters, Bruce Cockburn, Switchfoot, and more. However, in his younger days, Dan Russell wasn’t a business man at all. After high school, as a singer and guitarist, Russell’s great pastime became songwriting. But over time, his solo voice submerged, supplanted by writing collaborations, productions, or projects that came his way. He’d push his personal projects aside and help other artists on their projects. Working with his son, Jesse, producer and guitarist Michael J. Pritzl, plus Rachel Taylor and Ramona Silver on backing vocals; Russell approached the sessions for his first solo album, Feel the Echoes, as a rare gift of time given to himself. His performance band includes his son, Jesse, and former Daughtry guitarist Drew Yount; in November 2018, they shared the stage with Mac Powell of the four-time GRAMMY® award-winning Third Day.